This garden chandelier adds the perfect touch to create an enchanting garden scene inside or out. 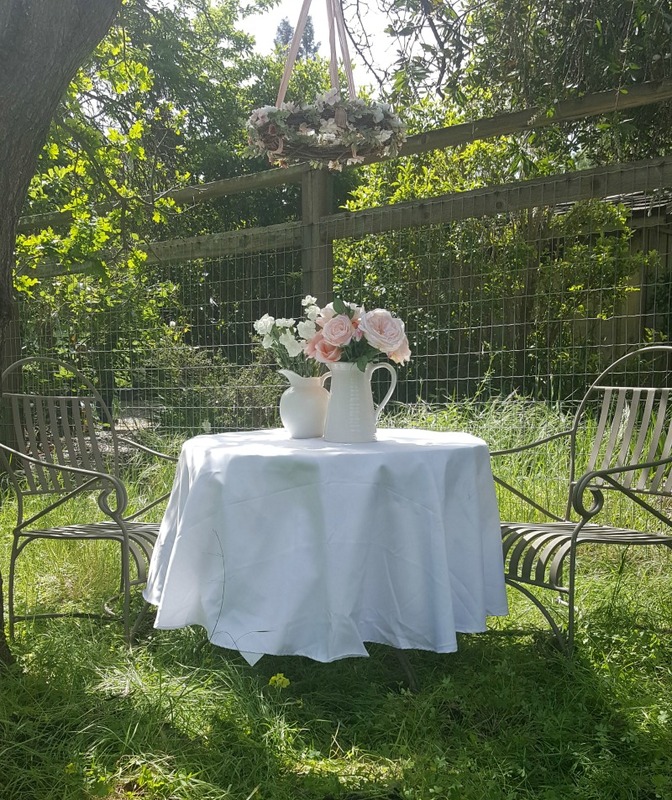 I love the idea of a garden party, don’t you!? I have images of fresh flowers, the fragrance of jasmine and gardenia wafting through the air. Warm breezes and sweet tea. Friends gathered and easy conversation. Can’t you just picture it? 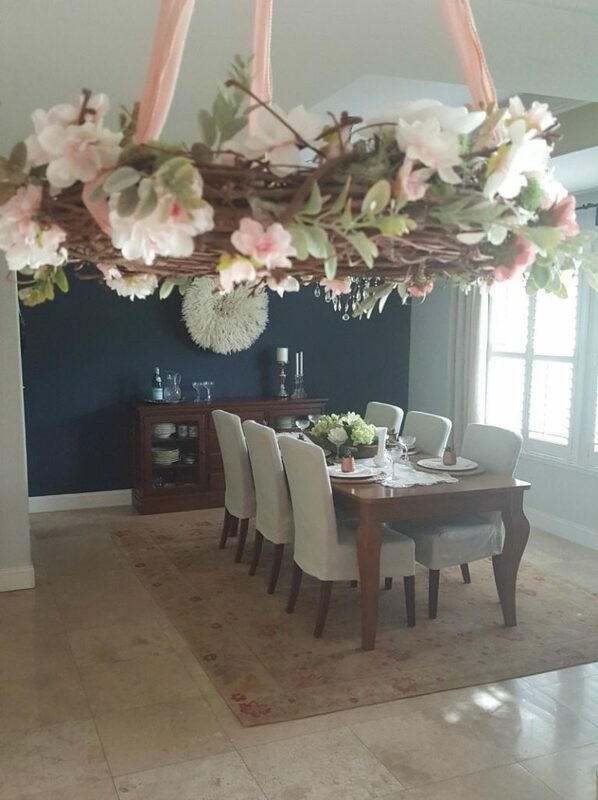 This was the motivation behind creating this hanging garden chandelier. 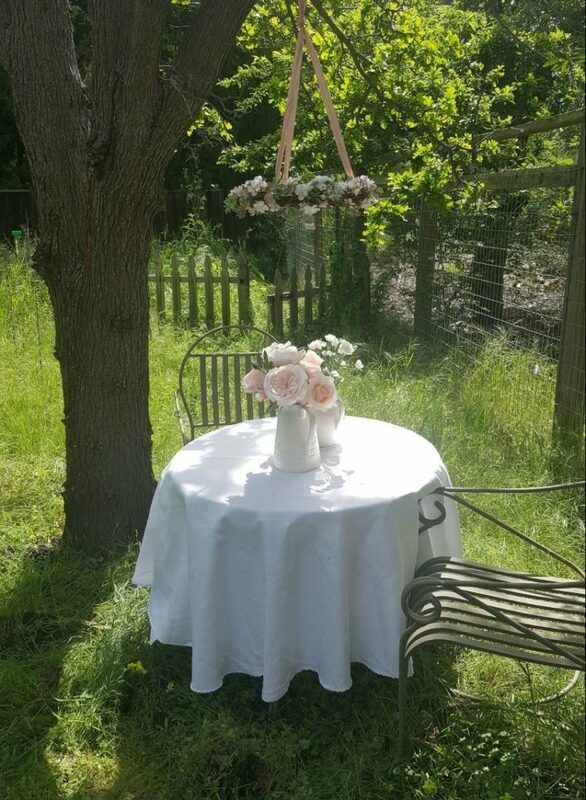 I wanted to set the stage for a picturesque garden party. And the bonus that I wasn’t even expecting? The versatility of this chandelier! 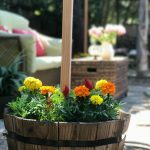 If the weather isn’t cooperating or if it rains on your party this project will help you bring the garden feel inside. 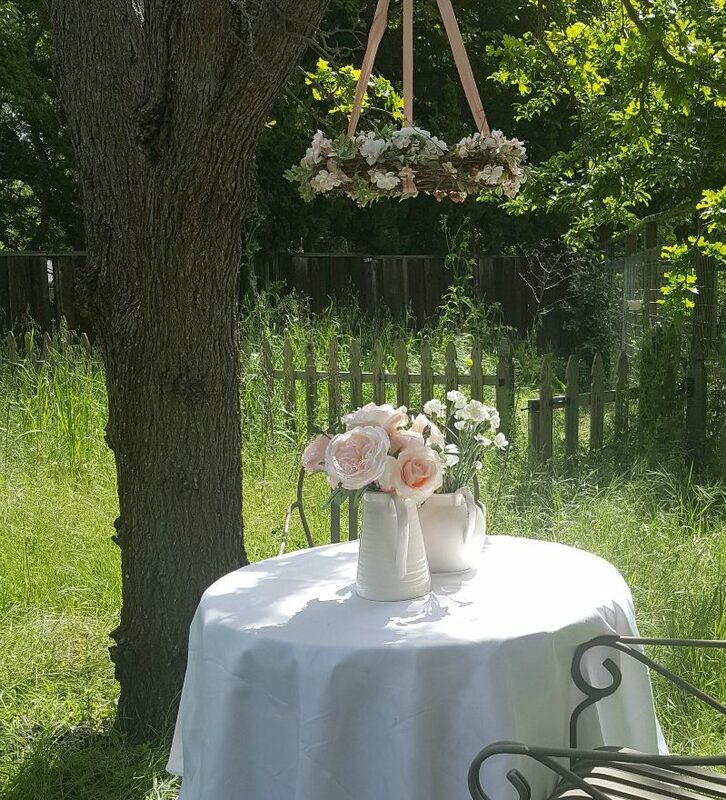 I’m going to show you different ways to use your hanging garden chandelier so you can enjoy that same inviting summer garden party setting inside or out all year long! 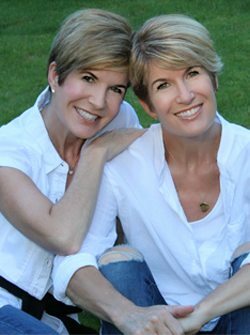 The following items include affiliate links for your shopping convenience and to help pay for our blog. Tea lights or candles, I have pictured actual candles but for practical use (indoors or out) I have linked waterproof battery operated tealights. First, cut 3 strands of ribbon or twine making sure you have plenty of length so you can hang from a variety of locations (estimate longer than you need because you can always cut the excess). 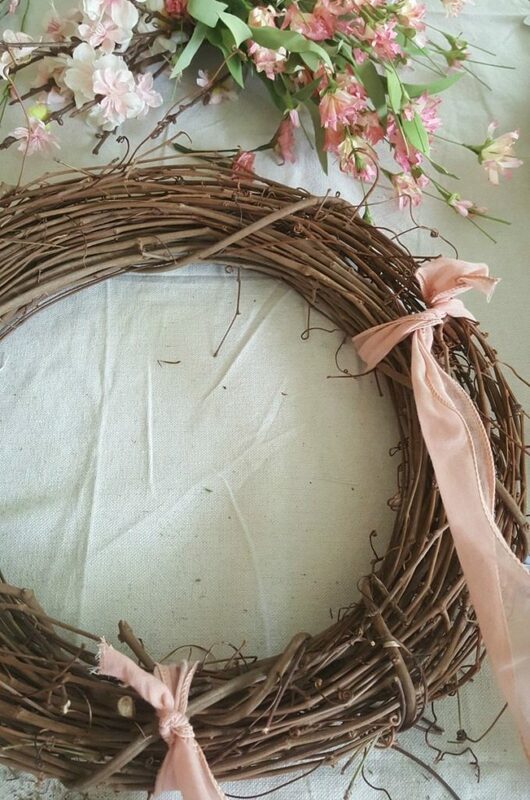 Next, tie each strand to the wreath spacing evenly around the wreath. 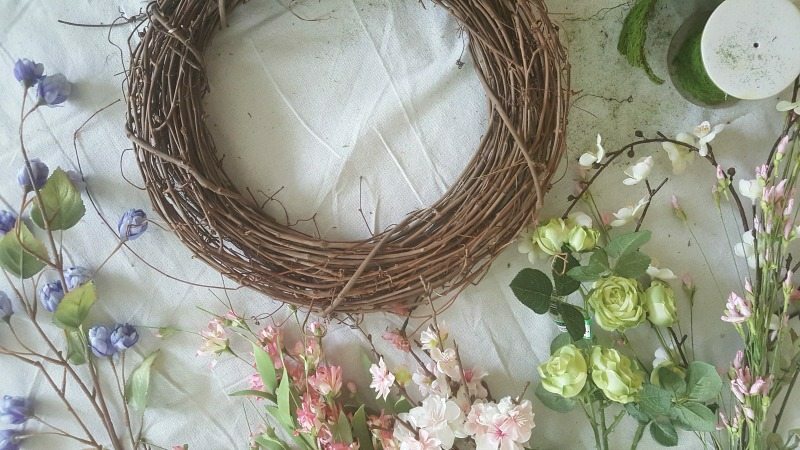 Thirdly, once the three strands are attached draw them up above the wreath (as if you were going to hang it) and gather them together about 1-2 feet above the wreath (depending on the look you want) and make a single knot. 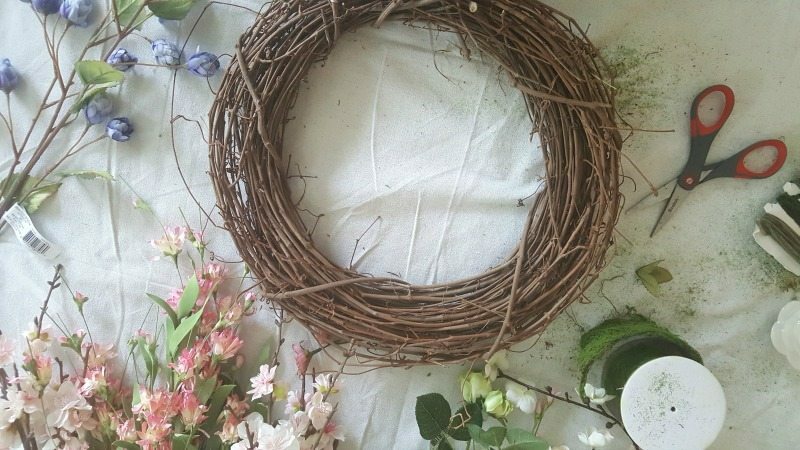 Next, decorate the wreath using your faux flowers and faux greens. I popped off small buds from faux stems. I cut small pieces of greens with wire cutters. Some pieces I was able to stick into the woven grapevine and get it to stay on their own. With other pieces I had to add a bit of hot glue to attach securely. In the end I added hot glue to most pieces once I had everything where I wanted it just to be sure. The decorating is the fun part and also the part where you can feel free to be the most creative. There is no right way to do this. You can add as much or as few flowers as you want. I wanted to keep the color palette to a simple pink monotone look but feel free to add as many colors as you want. It’s your party! 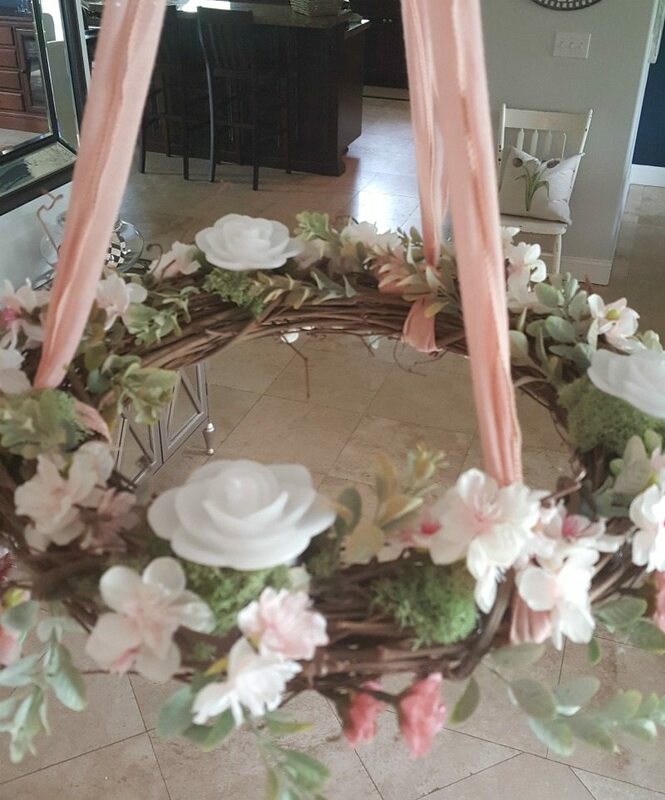 I decided to leave some of the grapevine wreath showing to keep a more rustic, natural look to my chandelier and allow the pink flowers and pink ribbon to really pop against the neutral background. How high will your chandelier be? Will people be able to see the top or only the bottom? You may want to concentrate more decor on the sides and bottom in that case. 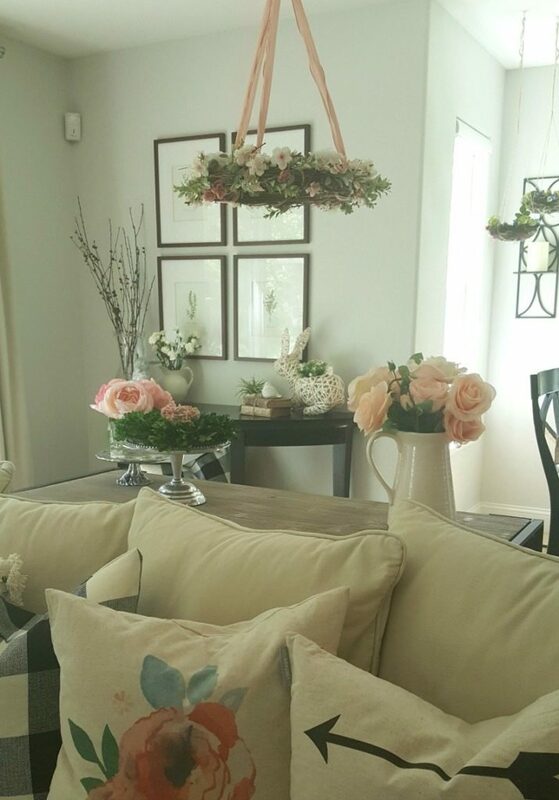 Add hanging flowers or vines to drape down off the edges for more drama. Add other details like crystals to catch the light and add some extra sparkle. Instead of short tea lights you could add taller pillar candles. 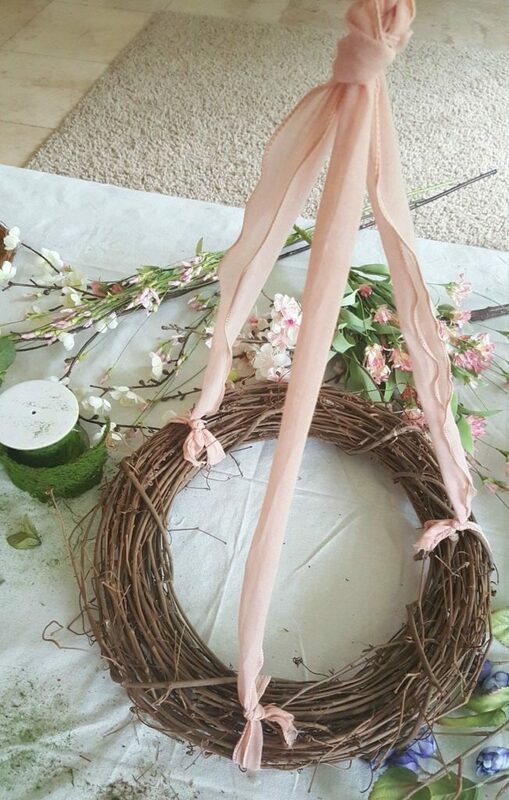 Add your own touches of whimsy, maybe a little faux bird or two, or whatever you want just to make it uniquely your own. 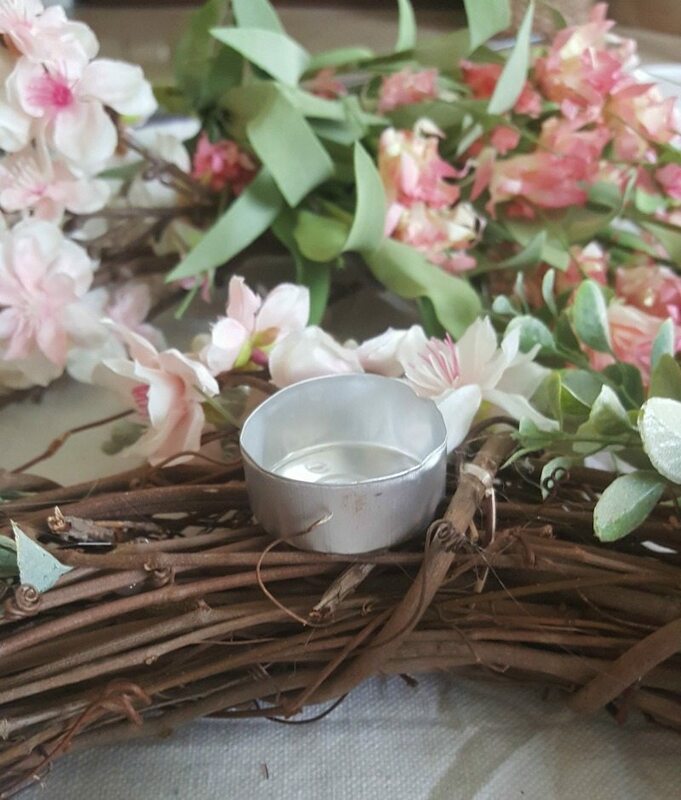 When I was satisfied with the decor I added the small metal tea light holders. 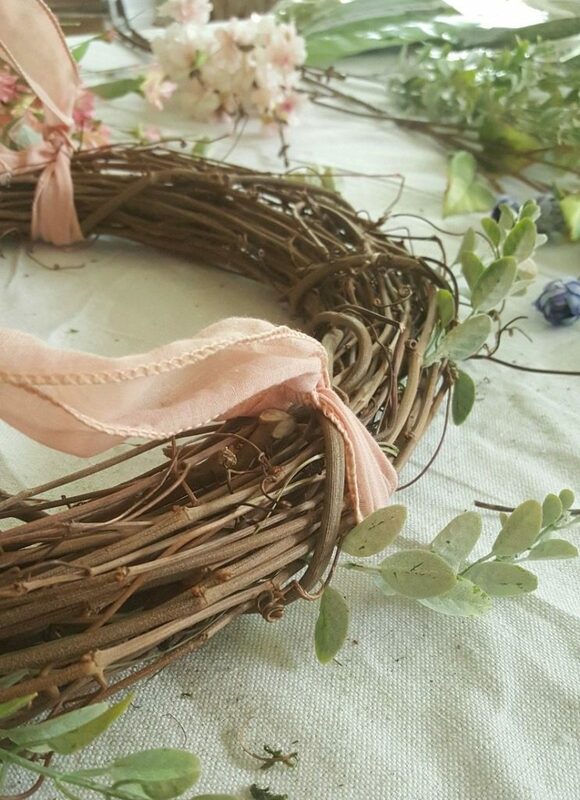 I removed the candles from the tea light tins and attached these to the top of the wreath using hot glue. I spaced the three tea light holders evenly in between where I had tied the ribbon. 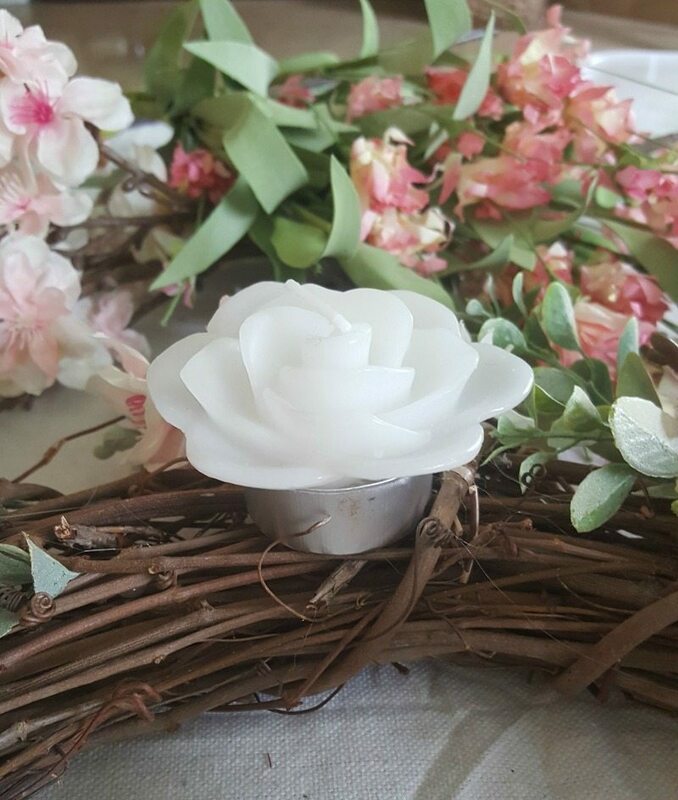 Once the tea light holders were secure I was able to simply “sit” the flower petal votives on top. There is no need to secure these. They should be able to rest here without any problem. 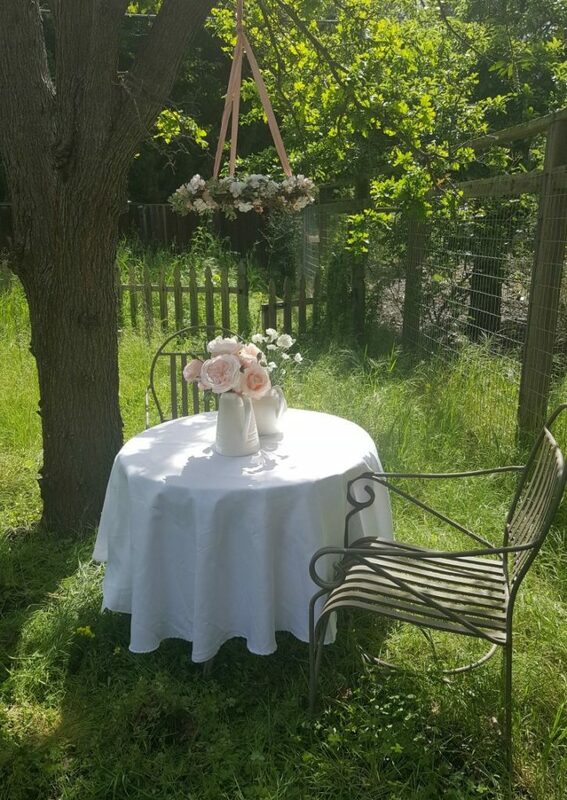 So now comes the versatility…did I mention you can use this garden chandelier indoors too? 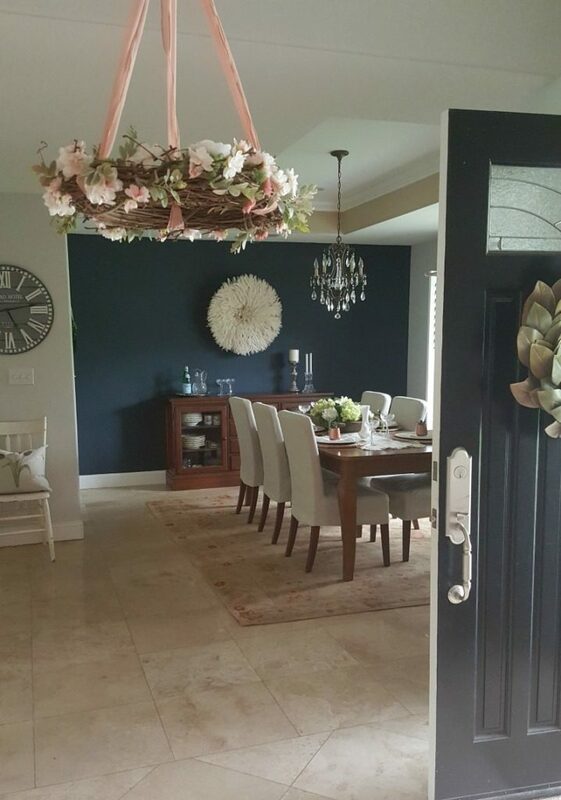 Look how it adds some gorgeous spring detail to my entry hall! Seriously, Friends, how sweet does it look gracing my front hall? Once I saw it here I realized I needed to make more than one! Luckily, due to the ease of fabrication and their low cost I was able to make another and not worry about blowing my budget. 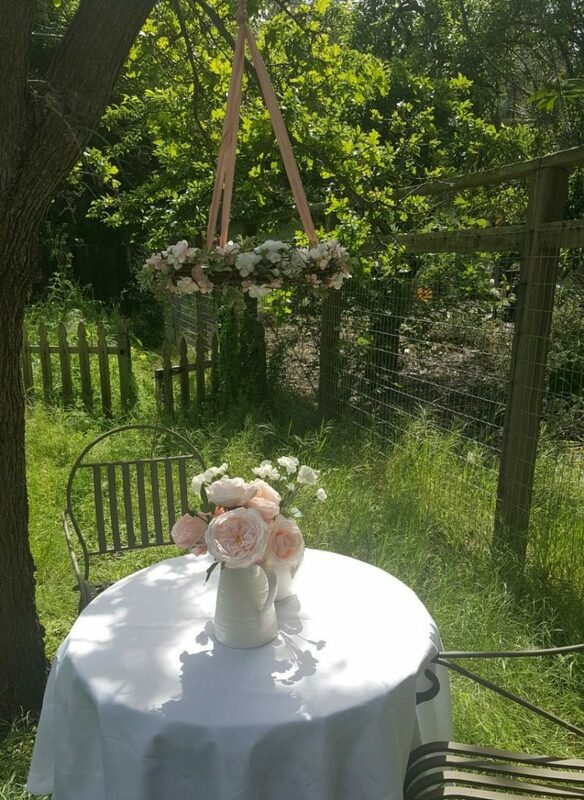 Whether it’s for every day or a special occasion this beautiful garden chandelier sets a special mood. As you can see in the pictures, I haven’t even set a table. 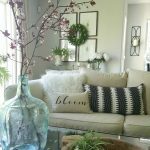 I wanted to show you how this project can easily transform a space all on its own. 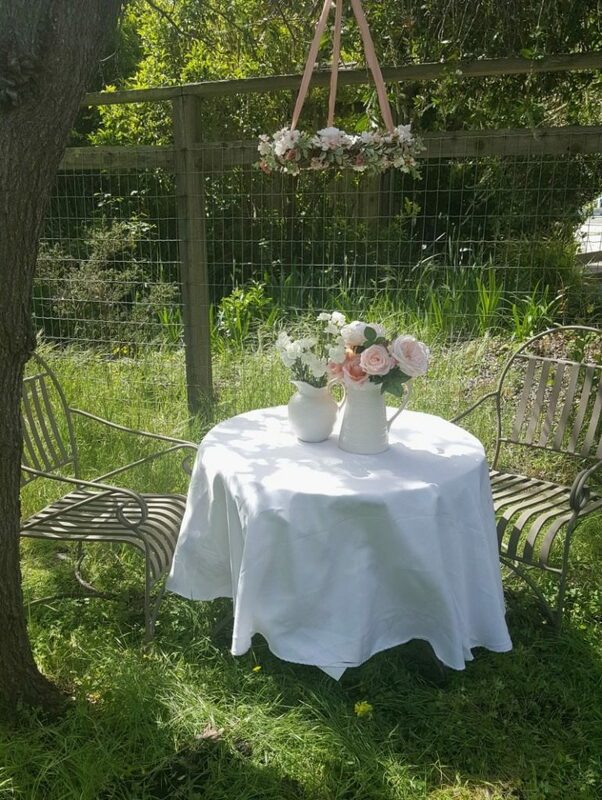 I placed this little table in the middle of my wild backyard setting, and look how it transformed the scene. Now imagine a pretty table set for Mother’s Day. Or a garden party space set up with lights strung from the trees, a pretty patio set up with hors d’oeuvres and cocktails and friends milling about….and yes, this pretty chandelier hung from the trees, pergola or trellis above. I can see it…can you? Your chandelier will add the perfect crowning touch to give your outdoor setting that extra something special! You don’t have to tell your friends how easy it was. We’ll keep that just between us! 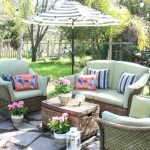 Whether you have a special occasion or want to add a special touch to your room, hall, or backyard setting, this is an easy, inexpensive and versatile project you are going to love. Now that you see how fun and easy these are I hope you are excited to create one or more yourself. While these are perfect for spring and summer I also started imagining a fall version. 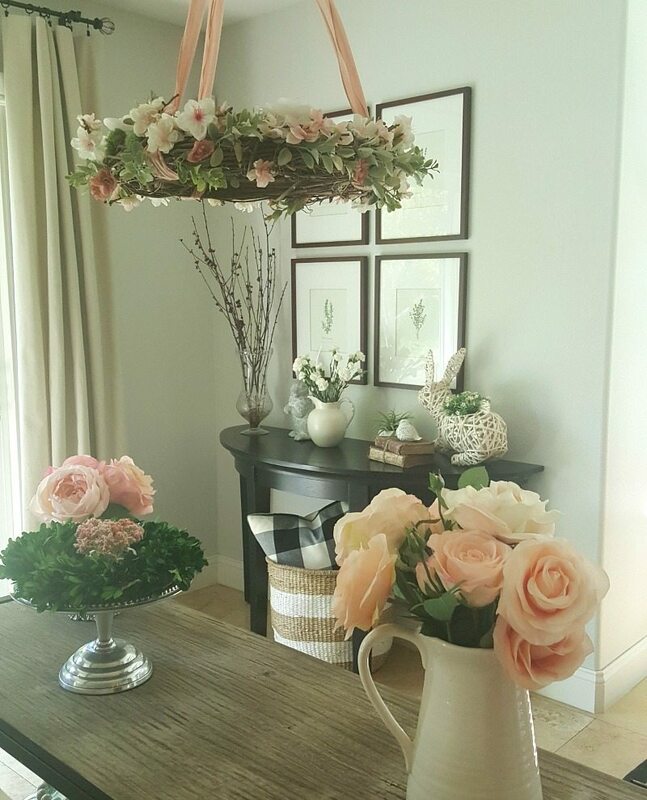 Replace the pink ribbon with twine, raffia or fall-colored ribbon, use fall colors and elements and you have a great new chandelier option to carry you through the seasons, limited only by your imagination. How about a Christmas version? Whatever your reason or season the versatility of this project makes it ideal for any occasion. Have fun and send us pictures of your creations. 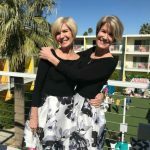 It’s possible we will include yours in an update of this post. 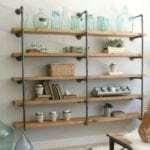 DIY Industrial Pipe Shelves! Build your own! This is so fun! Love it!! Thanks for the tutorial! I cannot wait to make a few of these. Simply elegant! How pretty is this?!? I’m thinking for a baby shower too?!! !